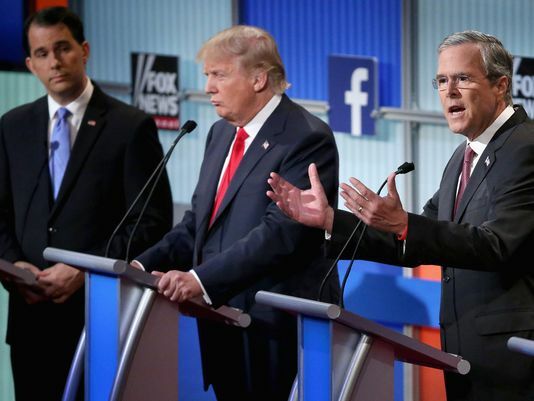 The first national polls since the Aug. 6 Fox News debate show Donald Trump solidifying his lead over erstwhile front-runner Jeb Bush among likely Republican primary voters. Fox News reported 25 percent Trump to 9 percent Bush, and CNN reported 24 percent to 13 percent. Political pundits and TV talking heads, initially dismissive about Trump’s candidacy, have flailed and floundered to offer a plausible explanation for the real-estate mogul’s spectacular surge in the presidential primary stakes. The Vox report offers a representative sampling: Bush seems too much of a political insider; the establishment wing of the GOP isn’t sold on Bush; conservatives don’t trust Bush; and Bush is bland and boring on the campaign trail. With the exception of the latter, none of the above rationales offers an adequate explanation, save possibly on the margins. The real reason for Bush’s fading presidential prospects is his bland persona — particularly in contrast to Trump’s star power. That is the conclusion I reached in an effort to come to grips with Trump’s appeal after consulting a measure I developed about 20 years ago to predict the winner in presidential elections prior to Super Tuesday. This heuristic model, developed in the Unit for the Study of Personality in Politics at St. John’s University and the College of St. Benedict, employs candidate personality traits, as publicly perceived, to predict which contender will resonate most favorably with voters. A caveat: The model is designed for general elections, where independent and so-called “low-information” voters — many of whom base their choice on the candidate’s personal appeal rather than party-political affiliation — hold the balance of power. Those dynamics are not necessarily in play during the primary process, which tends to be driven by partisan “base” voters. My research on the psychology of politics, spanning more than a quarter century, reveals voters respond favorably to candidates that are outgoing, self-confident and dominant; and negatively to candidates that are introverted and overly conscientious. Take Bill Clinton, to date the highest-scoring presidential candidate on my “Personal Electability Index.” Clinton is among the most outgoing, confident, energetic personalities I have studied — not in the least socially aloof and more undisciplined than conscientious. That distinction goes to the worst-scoring presidential candidate I have profiled: Al Gore, with a PEI score of minus 17. Conscientiousness is a desirable quality in a president, but on the campaign trail it feeds public perception of the candidate as stiff and formal, pedantic and boring. Of the three personal qualities that appeal to voters — extroversion, self-confidence (narcissism), and dominance — Trump trumps Bush on all three, by a New York mile. On the two attributes that diminish a candidate’s personal appeal — introversion and conscientiousness — Bush takes Trump to the cleaners. Unfortunately for Bush, what would be a personal strength in the White House leaves the average voter cold. The personality score sheet shows Trump defeats Bush decisively with a PEI score of 62 to minus 3. That’s minus 3, the worst score since Al Gore. So personality does matter, at least for now. But only time will tell how prominently character will figure in this election cycle; a broad array of personal and situational factors will be in play. Will Trump’s inflated confidence cause him to overreach and self-destruct? Will Clinton’s deleted emails serve to wipe her off the election ballot? Will Bush’s political connections and considerable campaign war chest carry him through? This is the opinion of Aubrey Immelman, associate professor of psychology at the College of St. Benedict and St. John’s University, where he directs a faculty-student collaborative research program in political psychology, the Unit for the Study of Personality in Politics.